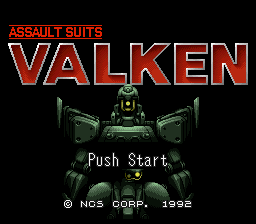 This is an English translation of Assault Suits Valken for the Super Nintendo. 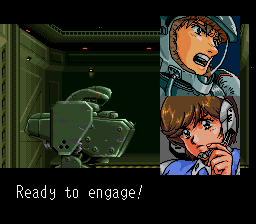 And here it is, the unedited, uncensored Japanese version of Cybernator! 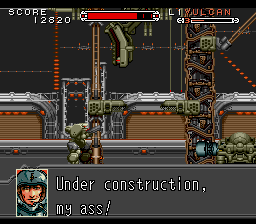 There are still some random text display issues, and you can’t change Jake’s name, but other than that it’s fully playable! 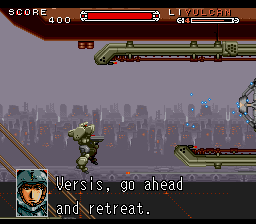 The translated script is very well-written (barring some unfortunate typos late in the game), and certainly reads easier than the game’s original English script, but unfortunately the patch is very glitchy, to the point that it severely impedes play. 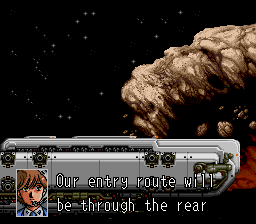 The game frequently crashes in the final stages (typically during the bosses of the final stages), and in one segment in the penultimate level, a corridor containing an item is blocked off with garbage tiles, forcing the player to reset if they happen to enter the corridor from below.